The title of this article shouldn't sound like a breaking news headline, but let's be honest, it does. Most PowerPoint presentations are bullet-point-riddled text-heavy electronic projections of a speaker's notes. Most lawyer-delivered PowerPoint presentations are the same — just with even more text and smaller fonts. As a result, a significant majority of speakers (and lawyers) using PowerPoint presentations are hard to understand and dramatically less persuasive than they could be. There are exceptions of course. The kinds of litigators and others who become clients of A2L Consulting's litigation graphics division are the first exceptions. They typically learn the rules of effective presentation and high-level visual persuasion based on well-established neuroscience principles and rigorous psychological studies. The second exception is Lawrence Lessig, a Harvard law professor. Professor Lessig did so many things correctly in this presentation that it is worthy of study by litigators and presenters alike. I'm not going to suggest that this is a perfect presentation for a courtroom environment, but it is a very good model for a situation where you want to persuade an audience to act or see things your way. Still, there are important lessons for the courtroom here. Understand that when I say this is "a very good model" that I'm not simply giving my opinion (even if it is based on 20+ years of helping litigators win cases using visual persuasion techniques). Rather, this assertion is based on the latest science about what persuades people. In contrast to my articles pointing out what can go wrong like The 12 Worst PowerPoint Mistakes Litigators Make, The 14 Most Preventable Trial Preparation Mistakes and 6 Trial Presentation Errors Lawyers Can Easily Avoid, here is a time-coded list of seventeen things I see that Professor Lessig did exceptionally well. 00:22: Attention Grabbing Words: His first few sentences use words designed to get you interested. When we hear "protest," "Hong Kong," and "China," most people are going to take notice given the historical inconsistency between these terms. 00:32: Use of Video: Showing moving pictures is more captivating than a still image, and starting off with video serves to draw the audience in emotionally from the very beginning. The fact that this is a protest by children further serves to drawn in the audience emotionally. 00:55: Text Highlighting. It is generally a bad idea to read what is on screen. Notice how you don't really understand what he is reading while you're looking at it. That's because of the split attention effect. When he takes away the unnecessary words, you see exactly what he wants you to remember. That is a good method of highlighting your key message. 1:07: Clear and Easy-to-Understand Persuasive Graphics: The imagery is simple and supports a simple point. There are two steps, and a small group stands in the middle to act as a filter. He uses a nice clear graphic to describe gerrymandering at 13:51 as well. Litigation graphics do not have to be complex to be effective. See Litigation Graphics: It's Not a Beauty Contest and 16 PowerPoint Litigation Graphics You Won't Believe Are PowerPoint. 1:20: Proper Font Size: Except here for making a point, Professor Lessig rarely gets below 28 point font size. See 12 Ways to Eliminate "But I Need Everything On That PowerPoint Slide." 1:28: Use of Information Design Principles: I wrote about the use of dots to represent small numbers in Securities Litigation Graphics and Juror Communication, and it is a useful technique, especially when combined with a more literal explanation and an oral explanation. 2:35: Appropriate Use of Humor: He works in a House of Cards reference without ever saying a thing and draws a big laugh. Humor certainly does not always work in the courtroom, but in this environment, it is entirely appropriate. 4:09: Analogy: Notice how Professor Lessig connects the concepts of China, Tweeds, Whites, Funders and more using the same text graphic and changing one word to carry through an analogy. He does this again at 7:50 when flipping between the America and China slides. See Courtroom Exhibits: Analogies and Metaphors as Persuasion Devices and Lists of Analogies, Metaphors and Idioms for Lawyers. 6:42: Nod to Steve Jobs: From the background used to the font size to the black mock turtleneck to the style of presentation generally, Professor Lessig is clearly a student of the extremely effective Steve Jobs-style presentation technique. See the 4th video in my article 12 Reasons Bullet Points Are Bad (in Trial Graphics or Anywhere), and you'll see exactly what I mean. 8:15: Immersive Graphics Presentation Style: We've written about the Broda-Bahm study demonstrating that the use of an immersive style (frequently changing and persistently used) of presentation has been shown to have the most persuasive effect on jurors. 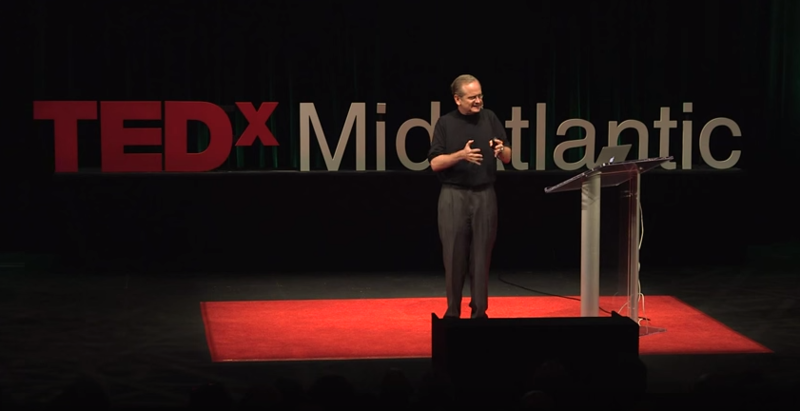 Professor Lessig uses this technique better than just about every lawyer that I've seen present. 11:42 and Throughout: Repetition: His use of visual repetition of charts and oral repetition is excellent. Count how many times he mentions "inequality" here. We wrote about how important repetition is for persuasion recently in A Surprising New Reason to Repeat Yourself at Trial. 17:00 Repetition and Rule of Three: Following in the footsteps of MLK, Winston Churchill, and others, Professor Lessig uses a classic rhetorical technique called Anaphora when he repeats his "you want - we will not get" phrase three times over. 17:33: Hard to Read Fonts: If you want to get your audience to pay attention, give them something hard to read. He uses that approach here with his "most important problem" slide. We wrote about this technique being used to overcome confirmation bias in Font Matters - A Trial Graphics Consultant's Trick to Overcome Bias. 18:31: Return the Focus to the Speaker: Watch as he decelerates the volume of slides to return the focus to the speaker. This is intentional and signals he is done with the presentation of evidence and moving on to his closing. 19:25: Closing: He contrasts reality with a dream of equality and makes his emotional plea. He contrasts between potential and reality or as Nancy Duarte described it, what is vs. what could be. Throughout: Surprise: From font changes to the incorporation of video to the use of humor to his constantly varying slide style, Professor Lessig uses surprise to keep the audience engaged. It may be the most important persuasion technique used throughout the presentation, and we have written about it in Could Surprise Be One of Your Best Visual Persuasion Tools? and 5 Ways to Apply Active Teaching Methods for Better Persuasion. There is a lot more Professor Lessig did right in this presentation, but these are some of the highlights. If you have been a reader of this blog for some time, these techniques should sound familiar. They are techniques employed by the world's best persuaders, they are the techniques we incorporate into our litigation graphics work, and every one of them can be used at trial to persuade more effectively.